Get the most out of your time in London and make sure to experience the best of London with one of our discount packages or great offers. Choose between the popular London Pass, our London Gold, Silver and Bronze Packages, Madame Tussaud, or our brand new & exclusive 4-in-1 London Package where you can save up to 50% on the total of your ticket purchase! 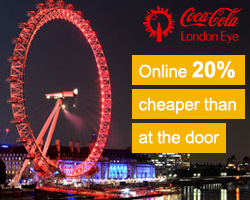 Visit two of London's most popular attractions - Madame Tussauds and Coca-Cola London Eye! If you buy your 2-in-1 London Combo Package online you save $45 compared to buying the tickets individually at the door. Book your combo deal online and save 40%.